Excellent replacement probes for all makes and models of oscilloscopes. 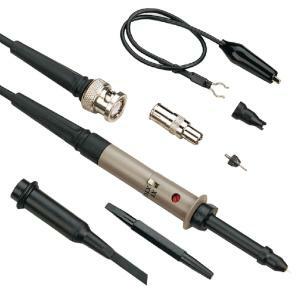 General purpose series 100 MHz, 1x/10x switchable oscilloscope probe. The High Performance family is a high quality, general purpose set of 5 mm Passive Voltage Oscilloscope probes. Certifications: Meets IEC 61010-031. RoHS compliant. Ordering information: Accessories included are 15 cm Ground Lead, Replacement Tip, Black Snap-on Sprung Hook, Tip Insulator, IC Tip, BNC Adapter, Probe Tip Ground, Trimmer Tool and Identifier Rings.